Clear the content of the value;. Abstract base class of a JSON value. A JSON document is composed of one value (usually of type "object" or "array"). JSON is defined by RFC 8259. This implementation is simple and basic. Fetching a non-existent element, field or whatever always fails silently by returning a reference to a "null" value. Thus, it is possible to access a complex chain of references without caring about intermediate errors. At the end, a "null" value will be returned. Floating-point values are not yet implemented. Reading a number always give a null object. 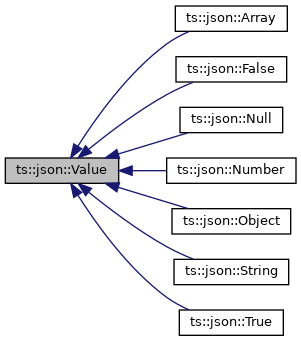 Get the JSON value type. Implemented in ts::json::Number, ts::json::String, ts::json::Array, ts::json::False, ts::json::Null, ts::json::Object, and ts::json::True. Format the value as JSON text. [in,out] output The output object to format. [in] indent Indentation width of each level. Check if this instance a is JSON null literal. True if this instance a is JSON null literal. Check if this instance a is JSON true literal. True if this instance a is JSON true literal. Check if this instance a is JSON false literal. True if this instance a is JSON false literal. Check if this instance a is JSON number. True if this instance a is JSON number. Check if this instance a is JSON string. True if this instance a is JSON string. Check if this instance a is JSON object. True if this instance a is JSON object. Check if this instance a is JSON array. True if this instance a is JSON array. Convert this instance to a boolean. [in] defaultValue Default value to return when no conversion is possible. The boolean value of this instance or defaultValue if no conversion is possible. For numbers, zero is false, all other values are true. For string, "yes", "true", "on" and non-zero integers are true; "no", "false", "off" and zero integers are false. Reimplemented in ts::json::Number, ts::json::String, ts::json::False, and ts::json::True. Convert this instance to an integer. The integer value of this instance or defaultValue if no conversion is possible. Strings containing integers are converted. Convert this instance to a string. The string value of this instance or defaultValue if no conversion is possible. Get the "size" of the value. The size of the value: the number of characters for strings, of fields for objects, of elements for arrays, zero for other types. Reimplemented in ts::json::String, ts::json::Array, and ts::json::Object. Get all field names in an object. [out] names Receive the list of field names. Get the value of an object field. For a JSON object, return a constant reference to the given element. When the field does not exist or for other types of JSON values, return a reference to a null JSON. Remove a field from an object. Extract a field from an object. The field is removed but its previous content is returned. A smart pointer to the extracted content or a null pointer if the field does not exist. Add a field into an object. [in] value Smart pointer to a JSON value. The pointed object is shared. Get an element of an array. [in] index Index to fetch in the array. For a JSON array, return a constant reference to the given element. When out of bound or for other types of JSON values, return a reference to a null JSON. Set an element of an array. [in] index Index to fetch in the array. If out of bound, the value is added at the end of the array. The actual index of the added value. Erase elements from an array. [in] index Index to erase in the array. Ignored if out of bound. [in] count Number of elements to erase. Extract an element from an array. The element is removed but its previous content is returned. A smart pointer to the extracted content or a null pointer if the element does not exist.